I decided to include a bit from St. James' Infirmary Blues in my Marilyn Monroe play, because it's about a hospital and the opening lyrics are ominous and I always liked the tune. I was very pleased to discover it's in the public domain, and surprised to discover that it always has been - it's apparently a folksong written by Anonymous. 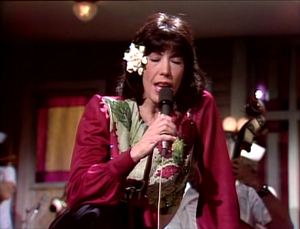 My first introduction to the song was a bit from an early season of Saturday Night Live, performed by Lily Tomlin singing along with "Howard Shore's All-Nurse Orchestra." The nice thing about this song is that you can change the lyrics any which way you want, pretty much, as long as you get the phrase "St. James Infirmary" in there. Which is a good thing because some lyrics make no sense. Originally I had the Marilyn Monroe character in my play singing "All By Myself" but then decided to have her sing "St. James" and have an actor playing Ella Fitzgerald perform "All By Myself." This cast has now doubled in size - originally it was supposed to be just two actors playing two versions of Marilyn Monroe, then I added a doctor and now Ella Fitzgerald. At least the Ella actor can also double as a nurse. Speaking of Ella, she made an album with Louis Armstrong which includes a cover of SJIB but only Louis sings on it. He chuckles and says "bragging." He smoked a lot of marijuana. Surely his baby is supposed to be dead. So why would she "look the wide world over"? To haunt? I'll probably just use the first four lines.